Well, no need for me to shovel the parking lot (see previous post). 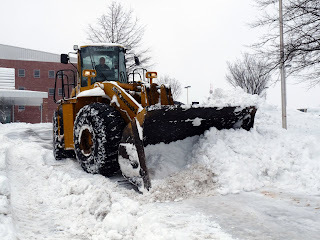 Doug Dunkle, director of Facilities Management was out most of the night and much of Saturday on a giant – and I mean giant – Kawasaki snow plow. He must have been exhausted when I spotted him Saturday afternoon, but to tell you the truth, Doug looked like he was having fun. Michael Kresse, supervisor of Engineering Services, used a Bobcat to work on the smaller piles and reported that his crew was managing to keep the roads and parking lots at the hospital “barely passable.” They never let up, but the snow just kept on coming. Priorities, said Michael, were to keep the roads around Fauquier Hospital passable and the sidewalks to the three hospital entrances clear. Other members of the hard-working facilities team handling snowblowers and shovels are: Mike Dodson, Larry Weaver, Scott Iseman, Gerald Sims, Phil Hunt, Del Clarambeau, Ken McCladon and Shino Kurin.